BASF has announced a first-of-its-kind liquid admixture that improves early- and late-age strength development in concrete. Dosed at up to 10 oz./100 cwt, Master X-Seed 55 is a stable suspension of synthetically produced crystalline calcium silicate hydrate (CSH) nanoparticles that facilitate growth of CSH crystals between cement grains and improve overall portland cement hydration. “Given the X-Seed technology’s widespread success in Europe since its 2009 launch, we worked to develop a unique formula specifically designed for North America,” said Admixture Systems Product Manager Chris Eagon during a Master X-Seed 55 unveiling at World of Concrete 2018. 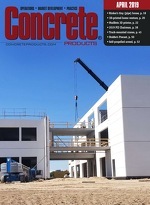 The admixture allows ready mixed and precast concrete producers to expand the performance space of a given mixture—conventional slump to self-consolidating— and optimize the cementitious material content, he added. Master X-Seed 55 likewise provides a strength safety factor, permits earlier stripping of forms to improve production efficiency, and promotes sustainable construction by enabling higher than normal levels of portland cement replacement. Testing concretes prepared with total cementitious material content of 611 lbs./yd. at 0.47 w/cm, BASF noted respective 1-, 7- and 28-day compressive strength gains of 46 percent, 18 percent and 19 percent for X-Seed 55-dosed specimens against controls. Companion tests gauging compressive strength development at the three intervals demonstrated the admixture’s potential to offset total binder requirements by 10 percent.